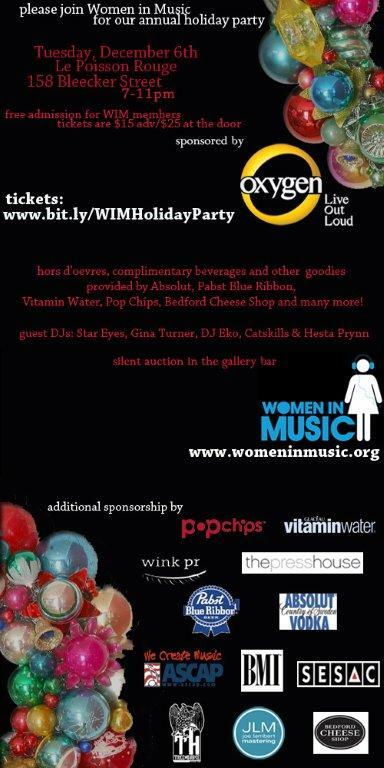 Women In Music Holiday Party 12/6 @ Le Poisson Rouge! Hello friends! I wanted to invite you all to a holiday party that is sure to be one of the best of the season! I am a member of Women In Music, a non-profit professional organization for women in all areas of music, ranging from performers, to writers, to lawyers, and more. I’m still a newbie, having joined in September, but have jumped in head first to the events committee, as event planning is one of my favorite things to do. Our holiday party is our biggest event and fundraiser of the year, and I would love to see your beautiful faces there. Here is some more info. The $15 ticket price gets you complimentary food and drinks by our sponsors while supplies last. Beverages will be provided by Absolut, Pabst Blue Ribbon, and Vitamin Water, and snacks by Pop Chips, Bedford Cheese Shop, among others. Tunes will be provided by DJ Hesta Prynn, DJ Gina Turner, DJ Stareyes, DJ Ecko and more to come! Along with refreshments and pumpin’ tunes, there will be a silent auction in the Gallery Bar, hosting merchandise ranging from signed memorabilia to wellness packages. All proceeds go to WIM so that we can continue to grow and create great programming for the coming year.